An enthusiastic table setting was inspired by inviting supportive loved ones. Additional care was given to no-bake, healthy and low caloric chocolate sweets. Consequences from indulging through the Holidays are still physically lingering. It seems like we were just at the holiday sweets table and here we are again. especially for those that celebrate Valentine Day events. Speaking of which, I've been meaning to shed perspective on this contentious event. you may be better served to skip right through to the recipes. For those who are maybe on the fence, you may want to keep reading. in my opinion, needs to be sincerely revised. couples who have enjoyed much love and support through decades. sentiments that at times lay down a road to unavoidable disappointment. decide if relationships get the chance they deserve. As a society we inadvertently go through several revolving doors. We seem to no longer pause and go deeper to appreciate the person we are with. I am of the philosophy of less expectation does reward in this case. Loyalty, respect, support and loving moments through the year make up for any one day event. bringing me more joy than I could have ever realized. Here, we sometimes celebrate collectively and not always necessarily on February 14th. It really comes down to how we view love on a grander scale. I do, however, absolutely enjoy decorating and setting the table which inspires my menu. Hopefully, my thoughts on a over-commercialized day can be a game changer for some. For others who don't agree, maybe we can still agree on our love of chocolate? 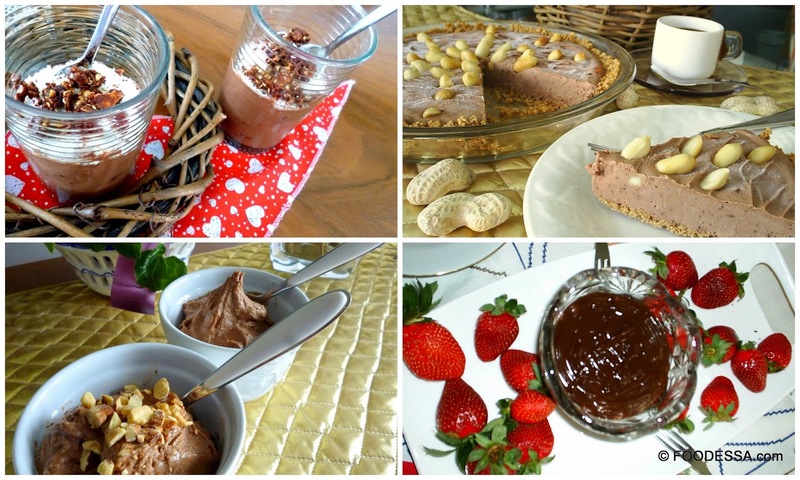 Over the years, I've developed several slightly guiltless desserts highlighting chocolate. The bonus is that they are no-bake, therefore, less fuss. they were mostly appreciated for their perfect chocolate finish to a generous meal. they are heart healthy, light and may I say…scrumptious. Indulge in as many bite size treats at the time. A lighter version in part due to eliminating the fat laden heavy cream. Evaporated milk completely succeeded in turning this confectionery into smooth and slightly guilt-free bliss. * Note: once the add-ins are prepared, reserve about 1/4 cup for the finishing garnish. 1. Lightly butter an 8x8 inch glass dish. Place a parchment paper inside overlapping only two sides for easier removal. Set aside. Tip: add two clips to hold the paper in place. 2. In a medium saucepan, heat together the sugar, milk and butter on MEDIUM heat. Continuously stir with a strong spatula. When the first surface boil appears, keep stirring for 3 minutes. Then, immediately remove the pot from the heat and stir in the chocolate and then followed by the marshmallows. Keep stirring until all is melted. 3. Add in the Rum one spoon at the time. Stir until all is well combined. Then, fold in the add-ins (except for the reserved garnish). 4. 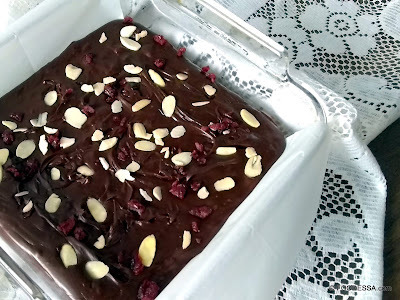 Pour the chocolate mix into the prepared dish. Lightly smoothen the surface and quickly sprinkle the reserved garnish over top. 1. In a small saucepan and over a LOW-MEDIUM heat, warm the milk until a light surface boil is reached. Stir once and a while. 2. Close the heat to then immediately add in the chocolate and stir until melted. 3. Remove the pot from the heat and stir in the Maple syrup, liquor, salt and confectioners' sugar. 4. Pour the chocolate mix into a heat-proof bowl. After 10 minutes, place a plastic wrap directly onto the surface of the mix with a tiny side opening. Place into the refrigerator for a few hours (minimum 4 hours) or until firm. 5. Prepare a parchment lined pan as well as your choice of coating(s) within a bowl or several bowls.
. Nut truffles: Add 1/2 cup (40g) coarsely chopped, lightly toasted nuts to the melted Ganache before adding the extract or liquor.
. Coffee truffles: Decrease vanilla and stir in 1 tsp. (5ml) good quality instant coffee OR just put 1 Tbsp. (15ml) Coffee liquor. maybe, a quick, comforting beverage will warm your heart as well as delight your tummy. * Note: if using a sweet liquor, make sure to adjust down the amount of Maple syrup used. 1. In a medium-small saucepan, gradually whisk together the cocoa powder and a little portion of the milk at first to make a smooth paste. Then, again pour the remaining milk as well as the water. Continue whisking to a smooth consistency. Lastly, add in the coffee. 2. Place the pot onto MEDIUM heat until a hot temperature is reached. Add in the Maple syrup as well as the optional liquor. Close heat. 3. Immediately pour the hot beverage on top of a small handful of mini marshmallows. Serve immediately.
. Add 1 medium cinnamon stick or a few cardamom pods. Add the spice into the liquid preparation about 15 minutes before putting the pot on the heat. Continue with the instructions as mentioned above. Then, just before adding in the Maple syrup and optional liquor, remove the spice. slowly replaced by a celebration to be grateful for our close circle of loved ones. Let's all enjoy the gift of chocolate in all its forms. May you have a chance to share your creations with others or just simply indulge on your own.